It’s high summer and life is beautiful — especially in a 5-acre paradise just off West Broadway. For the past 40 years, Columbians have found respite in Shelter Gardens, a botanical oasis nurtured by its corporate owner in a labor of love for its hometown. Shelter Insurance Cos. — known in a previous life as MFA Insurance — threw open the gates to its backyard on Aug. 4, 1975, and welcomed Columbians and visitors alike to stroll through the public gardens from dawn to dusk. Dedicated as MFA Gardens by MFA Inc. and MFA Insurance, the property stayed with the insurance company when it separated from MFA and renamed itself Shelter Insurance in 1981. Etymology aside, the crew of dedicated groundskeepers has kept this gem of a park in pristine condition through all seasons for the past four decades. Let’s take a birthday tour of Columbia’s favorite garden. A quiet haven awaits just inside the Shelter Garden gate, offering cool shade and the soothing sounds of water flowing at the Waterfall, Pool & Stream. Koi (Japanese carp) offer a colorful focal point among the lily pads. Hostas, impatiens, coleus and other low-light plants surround a flat-stone patio, flanked by tulips, rhododendron, magnolias and azaleas. 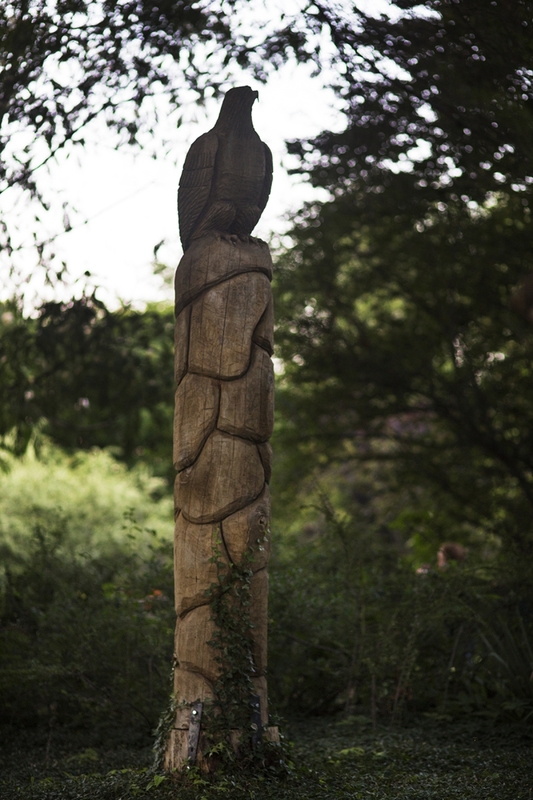 A dead tree at the front of Shelter Insurance headquarters found new life as this carved eagle, seemingly perched atop a totem pole. The recycling masterpiece stands sentry over the woodland landscape to the west of the Waterfall Pool. Pots of colorful “chilly chili” peppers flank each trellis. Despite their cool name, horticulturist Katrina Monnig warns these peppers carry a volcanic wallop. Numerous memorial plantings dot the raised flagstone beds; a plaque commemorates the rose garden dedication to the memory of Helen Sappington, whose husband, A.D. Sappington, presided over MFA Insurance from 1964 to 1979. 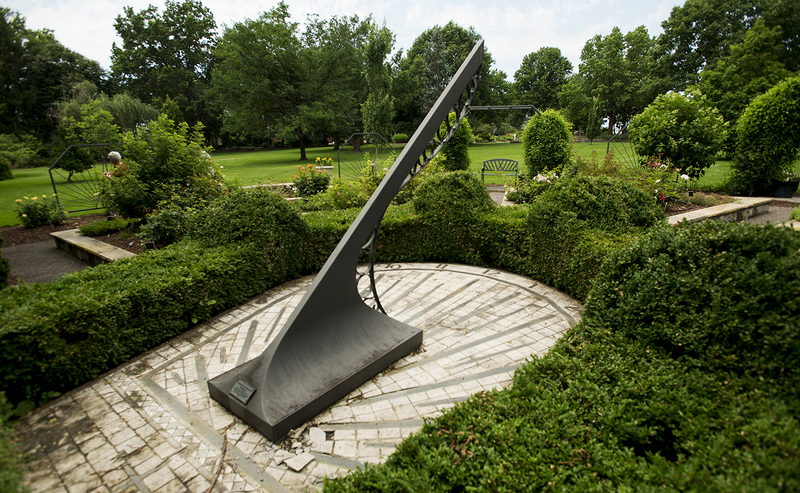 The sundial — set to Columbia’s 38 degrees latitude, 92 degrees longitude in Central Standard Time — is famously accurate only twice a year. [Cross the footbridge over the Lily Pool, where more koi frolic among panama pacific and blue beauty lilies, and take a seat in the gazebo for a panoramic view of the entire garden grounds. 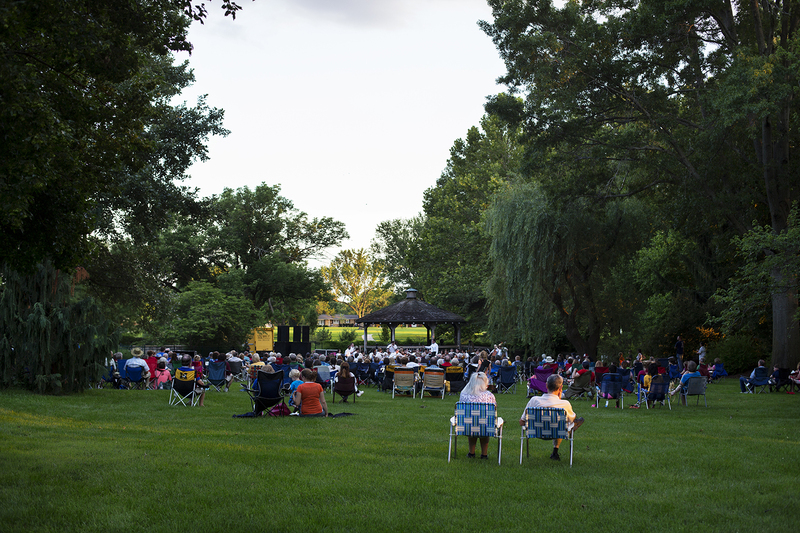 The gazebo provides a backdrop to the annual Concerts in the Garden that take place every June and July. The series features a range of local musicians ranging from the community band to groups performing pop, blues, symphony, folk, bluegrass and Cajun genres. The southwest corner of the gardens pays tribute to those who slogged through the horrors of war in southeast Asia. The Vietnam Veterans Memorial features ornamental grasses, bamboo, Japanese maples and evergreens in a serene setting accented by a trickling waterfall and pure white hydrangeas. Green seclusion envelops the path through the Shade & Fern Garden. A canopy of oaks shelters Virginia bluebells, hostas, ferns and woodland poppies. A short spur off the path offers benches, a birdbath, and bird and squirrel feeders, dedicated to the memory of Shelter Insurance executive Don Light. The slightest breeze sends the oversized wind chimes into a musical rhapsody. Yogi Berra once said, “When you come to a fork in the road, take it.” And well you should as the Shelter Gardens path winds to the northwest corner. 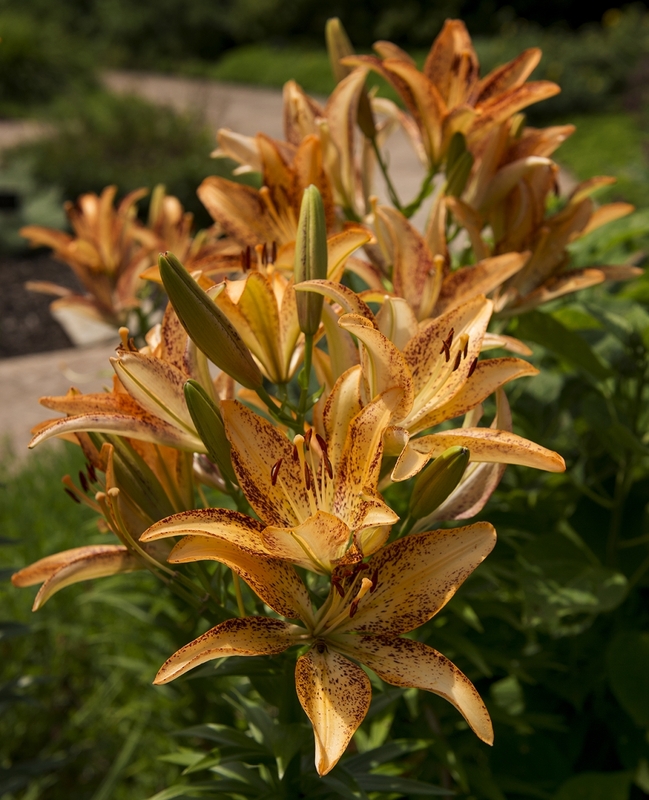 Go straight to explore the Deciduous Shrub Garden where an In Memoriam display pays tribute to Shelter employees and agents who have passed. The right fork opens up to the exotic wonders of the Japanese Garden. 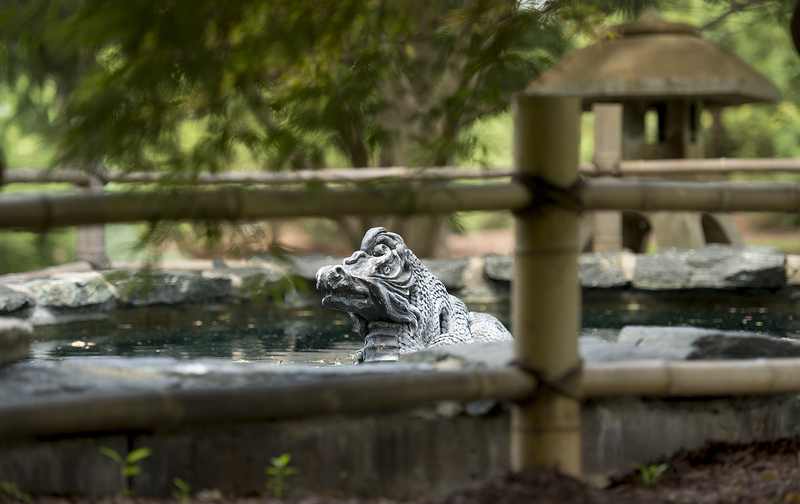 A weathered stone dragon surveys his realm from a fountain-fed pool, encircled by a colorful cadre of Japanese maples, including weeping dwarfs, upright and cut-leaf. A pagoda completes the Asian illusion. Don’t miss the aromatic Conifer Garden at the convergence point of these two paths. A few whiffs of the cedar, pine, spruce and fir will soon have you humming “O Christmas Tree,” no matter the season. Across the pathway is the Succulent Garden, dedicated to Shelter agents and employees who served in Operation Desert Storm. More than 500 native succulents carry the Southwest theme; yuccas and sedums bring color to the desert landscape. After viewing this arid bed, quench your senses in the rose-ringed fountain to the north. A loop to the northeast brings visitors to one of the most unique facets of Shelter Gardens, the Sensory Garden. Here, one can indulge in the fragrance of herbs and blooms, and feel the texture of a petal, a leaf or bark. Touching is encouraged here. The Sensory Garden was designed for the easy enjoyment of blind visitors, with waist-high beds laid out in a circular pattern along a trenchlike path; markers in English and Braille identify the plantings. Citrusy lemon balm and pungent fernleaf tansy join the chorus of scents from herbs such as cilantro, thyme and peppermint. Korean spice viburnum boasts a crown of perfumed blossoms in the spring and a faintly spicy, textural bark in the summer. Knobbly angel wing begonias, prickly viburnum and Thailand Giant elephant ear offer tactile sensations. Aromatic plantings vary; some years feature basil, oregano and chives in the beds. The popular scented geraniums — with their chocolate, orange, lemon, peppermint and ginger smells — are on hiatus as the grounds-keeping staff deals with repeated thefts of the plants. Tucked away on the far northeast corner is the Butterfly/Hummingbird Garden, ablaze with bright yellow coreopsis, “moonshine” yarrow, pink and violet geraniums, purple salvia, veronica, scarlet bee balm and more. Circling around Shelter Gardens maintains a sight line of the grounds’ focal point Newcomer School, a replica of the 19th-century schoolhouse where seven men met in 1914 to form what would become MFA Inc., with its spinoff businesses MFA Oil Co. and MFA Mutual (now Shelter) Insurance. 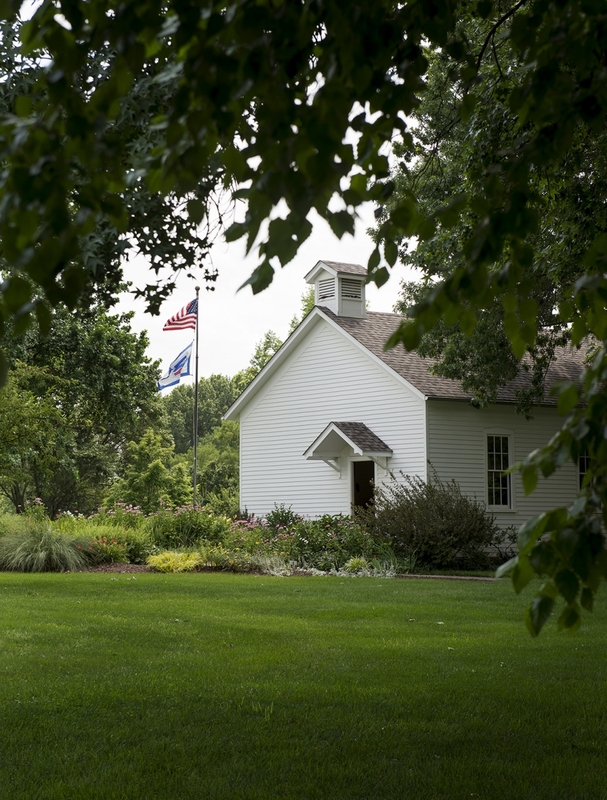 The schoolhouse’s interior stays true to its historic roots, a favorite with schoolchildren and other visitors. Plantings around the thrive in the mid-Missouri xeriscape — daylilies, coneflowers, chrysanthemums, hardy mums, sedum, black-eyed susans and daisies. A nearby hand pump is ringed with Knockout roses, a hardy rose that thrives in this area.